Like the picture above clearly says, the beauty of one's outfit is not dependent on the outfit or on the price tag of that outfit but on YOU (the person wearing it). 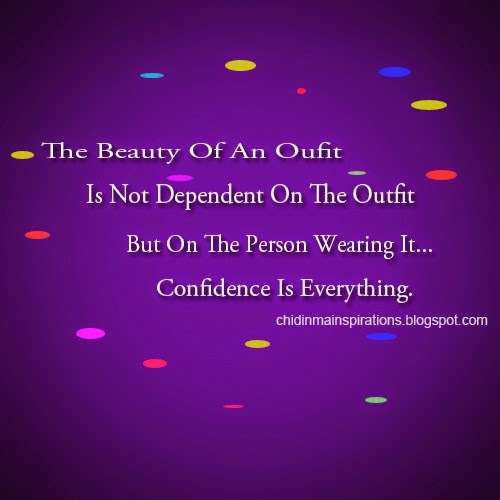 So make sure, you are confident in yourself irrespective of how much you bought your clothe/outift or on how you think your outfit looks. You are the main determining factor to how beautiful or ugly your outfit is/looks on you. Therefore make any outfit your wear look beautiful or great on you by unleashing your gift of style (style is within. Style is a gift) and by carrying yourself with pride (pride in this case is confidence) . P.S- There is a thin line between pride and confidence be sure not to cross it. I hope you have been inspired. Please be kind enough to share this post with others. Please also feel free to share your thought by commenting below.